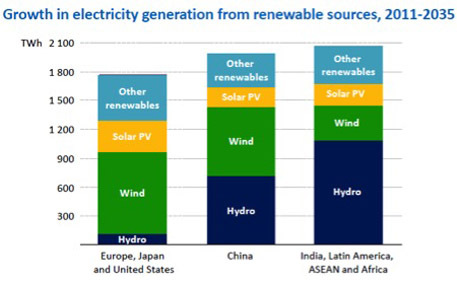 The latest report released by the International Energy Agency (IEA), which focuses on the new trends in the global energy market, says that renewable energy will account for nearly half of the increase in global power generation in 2035, with variable sources – wind and solar photovoltaics – making up 45 per cent of the expansion in renewables. The annual report, World Energy Outlook 2013 (WEO-2013), was released last week in London. World Energy Outlook provides an annual assessment of the developments in global energy markets and analyses the energy and climate trends in the future. This year the report focuses on how new technological advances are opening up unexplored oil reserves, especially in the United States and Brazil. This has led to reduced dependency on Organization of the Petroleum Exporting Countries (OPEC) for world’s oil supply. But West Asia is still the only large source of low-cost oil. The report also says the majority of world’s energy demand in the future (IEA scenario 2035) would lie with the emerging economies like China, India and West Asia. “Major changes are emerging in the energy world in response to shifts in economic growth, efforts at decarbonisation and technological breakthroughs,” said IEA executive director Maria van der Hoeven. 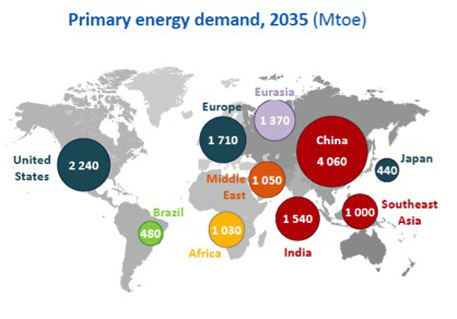 As per the central scenario of WEO-2013, China will dominate energy demand within Asia, before India takes over from 2020 as the principal engine of growth. It reports that India would become the largest importer of coal by the early 2020s. It will also be the largest single source of global oil demand growth after 2020. It also shows that Indian electricity demand would increase by 13 per cent by 2035. WEO 2013 says that by 2035, US will be able to meet all of its energy needs from domestic resources because of unconventional technologies like fracking. It notes that the net North American requirement for crude imports all but disappears by 2035 and the region becomes a larger exporter of oil products. US shale gas boom has brought forth large differences in regional energy prices. Natural gas in the United States still trades at one-third of import prices to Europe and one-fifth of those to Japan. These variations are bound to have enormous impact on industrial competitiveness, influencing investment decisions and company strategies. “Lower energy prices in the United States mean that it is well-placed to reap an economic advantage, while higher costs for energy-intensive industries in Europe and Japan are set to be a heavy burden,” said IEA chief economist, Faith Birol. On the climate change front, the energy sector will be pivotal in determining whether or not climate change goals are achieved since this sector alone is responsible for two-thirds of global greenhouse-gas emissions. Major improvements made in the direction are the renewed focus on energy efficiency and renewable energy sector. It forecasts that power generation from renewables will account for more than 30 per cent share in the global power mix ahead of natural gas in the next few years and falling a little short of coal as the leading fuel for power generation in 2035. The report presents the fact that the transition to a more efficient, low-carbon energy sector is more difficult in tough economic times, but no less urgent. Coal remains a cheaper option than gas for generating electricity in many regions, but policy interventions to improve efficiency, curtail local air pollution and mitigate climate change will be critical in determining its longer-term prospects. The flexibility and environmental benefits of natural gas compared with other fossil fuels put it in a position to prosper over the longer term.